The gravestone of the notoriously confident and talented Satchel Paige warns, “…don’t look back. Something might be gaining on you.” A simple offering of guidance – for artist and base-runner alike. The Rules for Staying Young explores the impact of baseball as an inspiration and conceptual model for historical and contemporary American artists, while investigating the ties between the game and the visual arts. From Thomas Eakins to Stephen Shore, baseball has captured the imagination and eye of American artists since its conception. The parallels between the timeless nature of our pastime and the evolving artistic studio are abundant, and remain profoundly relevant to contemporary practice. This exhibition highlights the rich territory between game and artist, where the perpetual moments of art and baseball meet. Part invention, part spectacle and part investigation, GREAT MARTIAN PASTIME is a dynamic performance piece that offers a unique vision of the future of baseball: during the colonization of space. “I grew up at Sixth Street and Erie Avenue in Philadelphia- the heart of El Barrio. Three blocks from my house stood Roberto Clemente Middle School. In the early eighties, Clemente’s shadow loomed large over my neighborhood. In the late nineteen-eighties, Puerto Ricans became more “Americanized”. Borinquen children wanted to “Be Like Mike” as much as anyone else. Basketball ousted baseball as the sport of choice. This “conversion” caused me to reflect upon how people see themselves culturally through sport- since Puerto Ricans long knew of basketball but did not embrace it, until the days of “His Airness” (the most marketed sports figure in history). I wanted to create a performance piece that corresponded with my existing body of work- focused on Mars’ ultimate colonization. I asked myself “If Mars is colonized, will the American settlers carry the sport with them? What changes will they make to accommodate a new homeworld?” I forsee baseball streamlining. As time becomes harder to come by, baseball succumbs to the clock. To avoid damage to ship hulls, a softer ball is used and batting is lost altogether. As settlers pack into crampt living quarters, it deals with spatial constrictions. GREAT MARTIAN PASTIME reminds us that baseball (as a sport and institution) has been at times both a liberator and oppressor to its practitioners. GREAT MARTIAN PASTIME acknowledges the games’ unifying impact on the racial and cultural fabric of our country – even as we potentially leave its lands behind. Ahlen Moin, a Delaware based artist, studied at the University of the Arts (Philadelphia, Pa) and the Tyler School of Art – Temple University (Philadelphia, Pa). Mr. Moin was recently the recipient of a Delaware Division of the Arts Grant (2009). Artist Lee Walton will be orchestrating a large-scale “live” wall-installation in our exhibition space at 4 W. 5th Street in Wilmington, De. The collaborative construction will be conducted to document a live baseball game between the San Francisco Giants and the New York Mets coinciding with the opening reception of The Rules For Staying Young. Detailed instructions and materials for public participants will be provided at the opening. “Often regarded as an Experientialist, Walton’s work takes many forms- from drawings on paper, game/system based structures, video, web-based performances, public projects, theatrical orchestrations and more. After a two-year affiliation with the Headlands Center for the Arts in Marin, Walton has received many accolades from Museum funded projects (Reykjavik Art Museum of Iceland, Indianapolis Museum of Contemporary Art, SECCA, ICA Boston), public commissions (Art in General, Socrates Sculpture Park, Rhizome at the New Museum of NY, national and international exhibition venues (Island #6, Shanghia, China, Clubs Project Inc., Australia, Ljubljana Museum of Art) and collections (Metropolitan Museum of Art, Martin Z. Margulies Wharehouse). Walton has also lectured extensively on his practice and related subjects. Recent lectures, panel discussions and visits include MIT, Art in General, The New School, Art Institute of Boston, Columbia, Portland State Univerisity and the University of Ulster, Belfast Ireland. PINCH HIT is a participation-based performance event (conducted by Michael Kalmbach) involving a batting cage, a ball and bat, music and you. American youths have dreamt of the moment that they reach the plate to bat – fans awaiting in anticipation – a song denoting your “arrival” (insert practice swings here) – to possibly shift the tide of the game – to be the hero (or the goat). Hitting a baseball has been acknowledged as one of the most difficult athletic feats to consistently accomplish – a stellar professional success rate is widely viewed as hitting in three out of ten chances to do so. The Major League Baseball record for highest career batting average is .367 (held by Ty Cobb). Out of 11,429 attempts Cobb hit safely only 4,191 times – a miraculous figure. How miraculous is this figure? “Streaky Hitting In Baseball”, Jim Albert (Journal of Quantitative Analysis in Sports – Volume 4, Issue 1 – Article 3 – 2008 – University of California – Berkley Press). Yet lasting fame still lies in one swing (Bobby Thomson. Joe Carter. Carlton Fisk. Bill Mazeroski.) – or miss. Steve Balboni (over 11 major League seasons with various teams) compiled completely diametric statistics – 181 HR & 856 SO (1 HR/ 17.2 AB – 1 SO / 3.6 AB) – often the “hero” and the “goat” (depending on which way the wind blew). PINCH HIT offers an opportunity for anyone to be the hero – the “star” – even for just a moment – to make “solid” contact. All that you have to do is pick up the bat and stand in. All equipment used in this piece will be donated to the local Wilmington youth baseball community. Michael Kalmbach, a Delaware based artist and arts advocate, received a MFA from the University of Delaware (Newark, De) and a BA from Bloomsburg University of Pennsylvania (Bloomsburg, Pa). His work has been exhibited at the Meat Market Gallery (Washington, D.C.), the Zhou Art Center (Chicago, Il), Haven Arts (Bronx, Ny), the Fe Gallery (Pittsburgh, Pa), the FAB Galleries – at Virginia Commonwealth University (Richmond, Va) as well as the Delaware College of Art and Design (Wilmington, De). Mr. Kalmbach is the Founder and Director of the New Wilmington Art Association in Wilmington, De, as well as a devout New York Yankees fan. With a 6½-game lead on the Cincinnati Reds with 12 games remaining in the 1964 season, Philadelphia collapsed in a 10-game losing streak (the first seven played at home). The “Phold,” as it is known, is one of the most notable collapses in sports history. The unfathomable collapse left the city stunned and heartbroken. 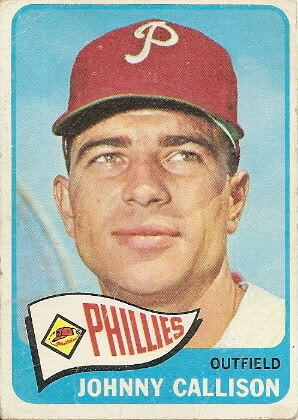 At the center of it was the rising Philadelphia Phillies star right-fielder Johnny Callison. He compiled a fantastic season in support of a Phillies push towards the 1964 pennant (.274 AVG / 101 R / 31 HR / 104 RBI / .988 FLD% – playing in all 162 games). A 1964 NL All-Star in the outfield, he became the All-Star MVP after hitting a walk-off 3-R HR to win the Midseason Classic for the National League [hear the call]. During the infamous “Phold” Callison posted a batting average of .250, including a late season game against the Milwaukee Braves (September 27, 1964) in which he hit 3 HRs (the Phillies still lost the game 14-8). REQUIEM by Peter Capano is an installation piece generated in conjunction with “The Rules For Staying Young”. Drawing from various memorabilia collections (including a close personal friend of Johnny Callison himself), Capano creates an imaginative nostalgic “space”, in an attempt to investigate the documented complexities of one of Philadelphia’s most beloved and enigmatic players. REQUIEM offers a reflective glimpse of Callison’s legacy in the lore of the region, the history of the game and the imaginations of his fans and detractors. Peter Capano is a Philadelphia based artist. He has collected and dealt baseball memorabilia since 1979. He currently works extensively with Hakes Americana & Collectibles (PA) and E & R Collectibles (NY). Mr. Capano is the author of “Baseball Collectibles” (Schiffer Publishing Ltd.). Mural artists Thomas Buildmore + Morgan Thomas have developed an original large-scale permanent mural to be executed in downtown Wilmington, De in conjunction with The Rules For Staying Young. Buildmore + Thomas’s project aims to offer the local community a resonant visual “beacon” for inspiring continued efforts to revitalize the education and play of baseball in urban environments. Thomas Buildmore, a Philadelphia based artist, is a graduate of the School of the Museum of Fine Arts (Boston, MA). His work has been exhibited and created at Fourth Wall Project (Boston, MA), Pandemic Gallery, (Brooklyn, NY), D.D.R. Project (Los Angeles, CA), 112 Green Street (NYC, NY), T&P Fine Art (Philadelphia, PA) and Paint It Now 2010 (Boston, MA). He is the Co-Founder of Overkill Studios, and previously Curator at The Wall@Central (Cambridge, MA). Morgan Thomas, a Philadelphia based artist, is a graduate of Williams College (Williamstown, MA) with a degree in Art, Anthropology and Sociology. She is the Co-Founder of Overkill Studios. Adaptation and the New Wilmington Art Association are pleased to announce a forthcoming catalog of The Rules For Staying Young. The catalog features original essay contributions from Brian Young (Head Curator at the Academy Art Museum) and Katrina Kuntz (Independent Curator & Critic – NYC / Lecturer – Stony Brook University, Dowling College / Contributor – ArtUS). Contact us to learn about preordering (adaptationart@gmail.com).